I actually made this last year for Naomie's birthday but I totally forgot to share it. It was really easy. I made her it to wear with a pair of longies that no longer fit her. Never mind, she wears it with a pair of black leggings now. 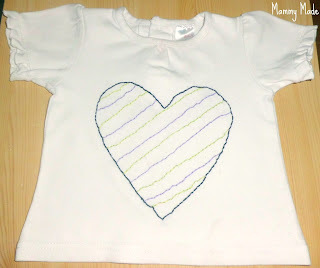 I actually love this top, it is so cute and was so easy to make! It only took me about an hour from start to finish. 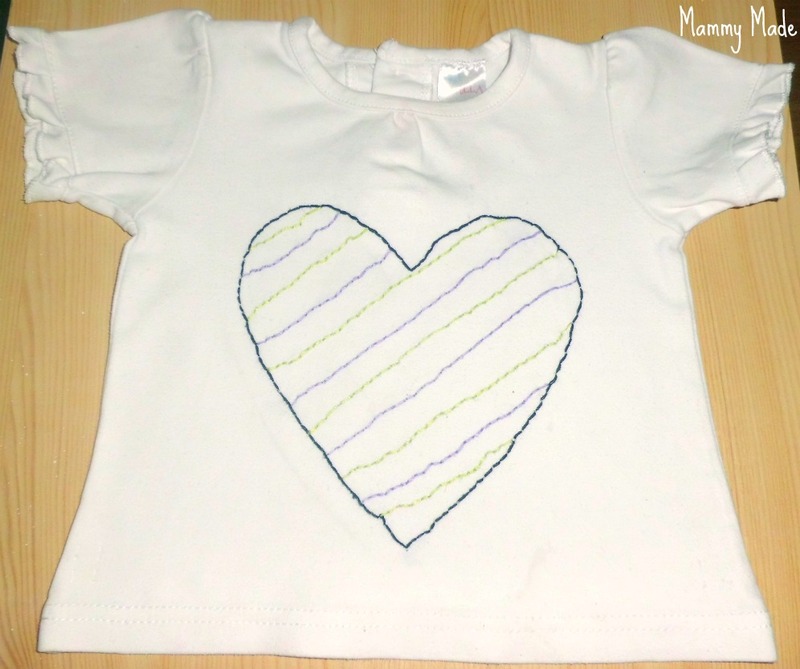 I drew a heart onto a plain white top with a pencil (might I suggest you use a washable marker as I can still faintly see the pencil after tons of washes!) 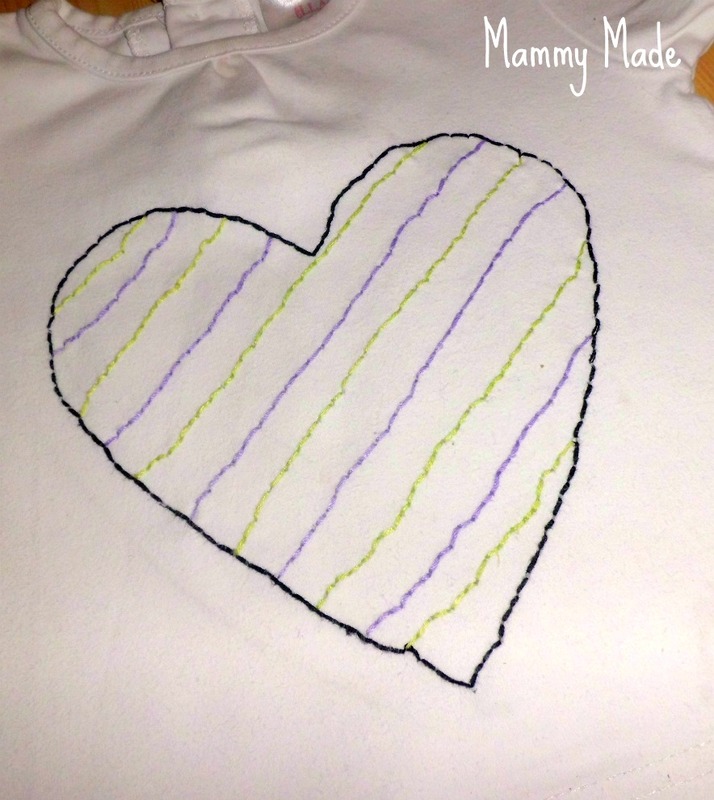 Then I took some black embroidery floss and started stitching short lines, using backstitch, to make my heart. 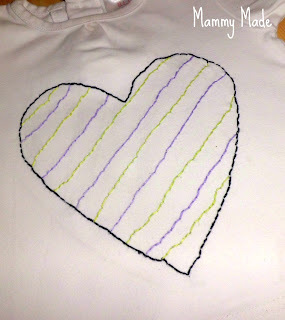 I then took some lime and purple embroidery floss and made alternating lines going across the heart. My heart is so far from perfect, in fact I don't think I actually have one straight line on this top haha. Oh well, it still looks cute on! It might have helped if I had added stabiliser but I didn't because it was the day before her birthday. As is always the case with me!! This is soooo darling! You made it sound so easy too! I found you at Cheri's blog hop, and am your newest follower, will you follow me back? Super cute! I love all the colors. I'd love for you to link up with Crafty Cousins. This is adorable! I followed you over from Sundae Scoop and I would like to invite you to share this, and any other posts, on my link party at www.michellestastycreations.blogspot.com. Have a great weekend.